Even Murdoch’s private joke is that “God doesn’t trust (him) in the dark.” Nor should anyone ever, including Wall Street Journal readers. They’ve seen the paper’s quality deteriorate since he took over, cleaned house, installed his own people in key positions, and now runs it like his other enterprises. He’s boss, what he says goes, including on editorial policy after he promised its former owner he’d keep hands off. It shows more than ever on the Journal’s opinion page, yet after Murdoch bought Dow Jones last August, Time magazine asked “Is the Wall Street Journal’s editorial page really ‘right-wing?’ ” It stated that “an editorial page should have a strong point of view (and) for years (and presumably now it’s) been one of the Journal page’s great strengths.” No disagreement from its hard right faithful who want their views expressed, never mind truth and accuracy, let alone honor and respect for the law. It showed up on June 17 in a John Yoo op-ed feature. He’s a tenured UC Berkeley professor (since 1999) teaching aspiring lawyers constitutional law at the Boalt Hall School of Law on campus. To the university’s embarrassment and shame, some, with good reason, call him “the torture professor,” and at least since fall 2005 have denounced him, demanded he be fired, protested inside and outside his classroom, and were arrested as a result. — justify virtually anything (including “unilateral presidential warmaking”) to defend “national security,” as so stated in his 2005 book, The Powers of War and Peace and in (at least two) memos dated August 2, 2002 and March 18, 2003; he, David Addington (Cheney’s legal counsel), and then-White House Counsel Alberto Gonzales wrote them; Jay Bybee, now a Bush-appointed federal judge, also signed them making him equally culpable. On April 1, Yoo’s infamous (81 page) 2003 one was made public. Days later, the National Lawyers Guild (NLG) and Center for Constitutional Rights (CCR) urged UC Berkeley to fire him. They also called for his disbarment and prosecution for war crimes. Hundreds of others in the country and around the world share similar views about a man who shames UC Berkeley, has no business teaching constitutional or any other law, and is guilty of high crimes, misdemeanors, and other abuses of the rule of law he disdains. — various other statutes that were (and still are) repeatedly violated with impunity by Yoo (earlier) and many other past and present Bush administration officials. Yet there was Yoo on June 17 given prime, near-half page space on the Journal’s opinion page to state his views on the important June 12 Supreme Court’s harsh rebuke of administration policy. It was in its Boumediene v. Bush (No. 06-1195) 5-4 ruling that Guantanamo detainees (most of whom have never been charged and are innocent) may challenge their detention in US courts in defiance of the 2006 Military Commissions Act – an unconstitutional October 2006 law empowering the administration and Pentagon (in military tribunals) to deny habeas, due process, and act as accuser, trial judge and executioner with no right of appeal and no chance for judicial fairness. Yoo objected in his piece titled “The Supreme Court Goes to War,” in which he rails against the rule of law the way he did as Deputy Assistant Attorney General and likely does in his classroom. He called the Court ruling “judicial imperialism of the highest order,” and stated: “The only hope for reigning in the judiciary is the November election (when) the next president will be in a position to appoint a new Court that can reverse the damage done to the nation’s security” – by which he means replacing retiring Justices with more extremist ones. He continued saying “out the window went precedent… Until Boumediene, the Supreme Court had never allowed an alien who was captured fighting against the US….to challenge his detention (in US courts).” Unmentioned is that nearly all detainees fall outside this classification. They were lawlessly and randomly seized; turned in for bounty; nearly all are innocent victims; yet have been isolated, imprisoned, denied counsel or an inadequate amount of it, and tortured in violation of international and domestic law. Some have died, been killed or committed suicide as a result. Granting them habeas rights is their best chance for justice long denied, and it can’t come a moment too soon. Calling Guantanamo detainees “al Qaeda terrorists” has no basis in fact. Most have been held for years without charge, under the dubious Geneva-superceded category of “unlawful enemy combatant.” They’re denied their human rights and humanity, and had little chance until now for judicial fairness. Yoo played a major role in the process. He insists it be continued, and got prominent op-ed space for his views – outlandish ones against the rule of law but championed by the likes of Murdoch. Unmentioned is Jose Padilla’s ordeal – a US citizen unlawfully held for nearly four years in military and civilian confinement as an “enemy combatant.” Charges against him were bogus and unjustifiable, yet he was denied due process, tortured, brutalized and dehumanized in solitary confinement. They destroyed him by turning his mind to mush, but it wasn’t enough. Last January, he was sentenced to 17 years, four months in a police state show trial for his “role” in a “conspiracy” to help “Islamic jihadists” – a concocted scheme to imprison and destroy him further on the pretext of protecting “national security.” Chalk up another win for injustice along with all the many others besides. And that’s besides the February 2006 Human Rights First report of hundreds of deaths in US custody, around 34 confirmed or suspected homicides, including at least eight from torture and likely more. Because of command responsibility cover-up, lax investigation, poor record keeping, and little attempt to treat these crimes seriously, few prosecutions occurred, and the stiffest penalty for any was five months in jail. None of this was in Yoo’s piece nor any sense of remorse, and in his judgment they likely got what was they deserved. Others share Yoo’s views and get ample mainstream space and air time to present them. Yoo as well in his classroom, and imagine how young minds are harmed. Instead of teaching constitutional law, he renounces it. So do others with clout, and that’s the problem. What’s ahead is anyone’s guess. Repressive laws won’t be repealed. Illegal wars won’t end, and extremist judges still dominate the federal bench, one favorable High Court decision notwithstanding. Deserving detainees are still denied justice. 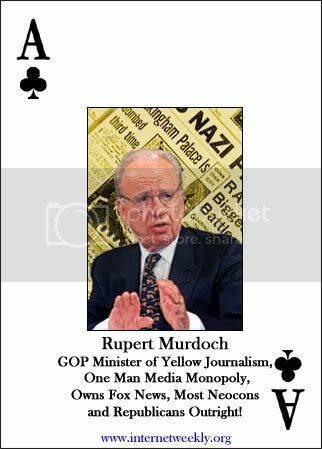 Their ordeal continues because influential war criminals are featured daily on major opinion pages where truth and righteousness lose out to hateful viciousness, and the nation slips closer to tyranny – thanks to men like Yoo and Murdoch. Stephen Lendman, a senior editor with Cyrano’s Journal Online, is also a Research Associate for the Centre for Research on Globalization. He lives in Chicago and can be reached at lendmanstephen@sbcglobal.net. Also visit his personal blog site at sjlendman.blogspot.com and listen to The Global Research News Hour on RepublicBroadcasting.org Mondays from 11AM – 1PM US Central time for cutting-edge discussions with distinguished guests. All programs are archived for easy listening.